So this week's Created By Hand and Quietfire Creations challenge is Queen of Hearts. PS check out the Quietfire Design 2nd annual challenge link below to win 1 of 3 prizes of $50 worth of Quietfire Design rubber. I've wanted to use this embossing folder for quite some time, and i guess this was the perfect time for it... I brayered Distress stamp pad on the embossing folder, then passed it thru my machine, clear embossed it. Sponged distress on the high points, spritzed some water and then dried. Cut it down to fit my tag punched with Tim's tag die, which was also colored with the green. Die cut the flourish, daubered some copper and sprinkled with gold micro fine glitter. Colored the hearts with a red marker and then some glossy accents. 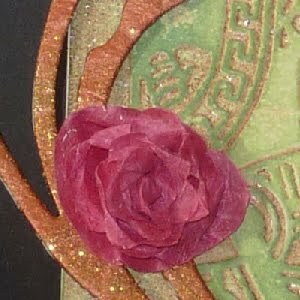 The flower is made from a double layer of mulberry paper and coiled, then smushed down a bit. Stamped the words (Quietfire Design) with Versafine Black Onyx. Wrote in my Heart word with a red marker and shadowed with black. Tied a bunch of colorful yarn. I Love the tag Yogi. 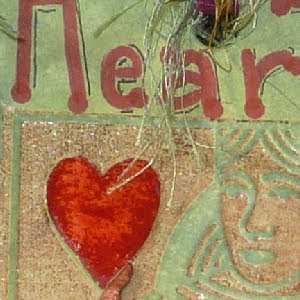 I am glad you are joining the Queen of Hearts challenge(s)! I am working on mine in my head still but will post mine when I finally get to set the idea free. ; ) Thanks for sharing your art with us and motivating me to get going on my piece. Great tag, so much going on to absorb. Your tag is beautiful Yogi. I will have to look out for that embossing folder, love the way you've used it. This challenge is the perfect application for this folder! 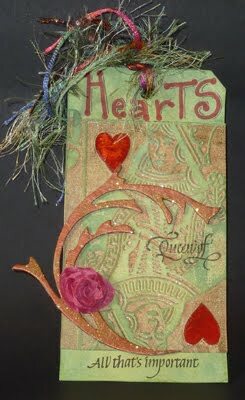 I really like what you did with it - but especially the copper, glittery flourish!